Richmond Bridge is a justly famous and picturesque crossing of the River Thames, much admired by visitors and locals alike. But how many people know that East Sheen has its very own Richmond Bridge? This one you won’t find anywhere near the river and it might be rather difficult to take a pretty photograph of it for the folks back home. For this Richmond Bridge exists in cyberspace and is the name of an enterprising online shop dedicated to the popular card game enjoyed by many people. 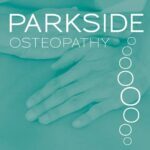 The business was created and developed by well-known local resident Linda Fishman and has been run from her home since 2005. A keen bridge player herself, she explained how the idea came to her in a moment of inspiration. Linda researched the market and found there is only one shop in London dedicated to the game played by over 200 million people worldwide, and it mostly stocked books on how to play. Before taking the plunge, she took a table selling bridge items at the popular Christmas Market at the Bank of England Club where sales convinced her it was a gamble worth taking. 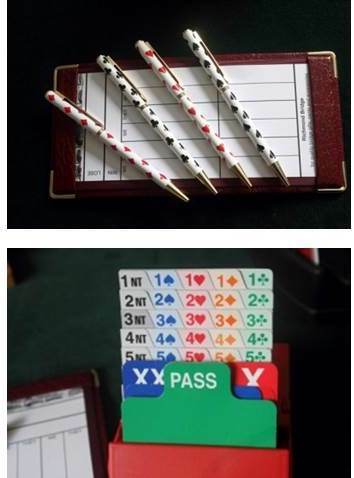 Now a look at her attractive website www.richmond-bridge.co.uk reveals a whole range of bridge playing equipment from cards and folding tables to high quality glassware and china, gifts, pens, and even bridge-themed greeting cards and a bridge players’ calendar. Linda has refined and developed her stock over the years to respond to what people want, but she always insists on top quality. “I won’t sell cheap cards which won’t stand up to the wear and tear of regular play,” she said. 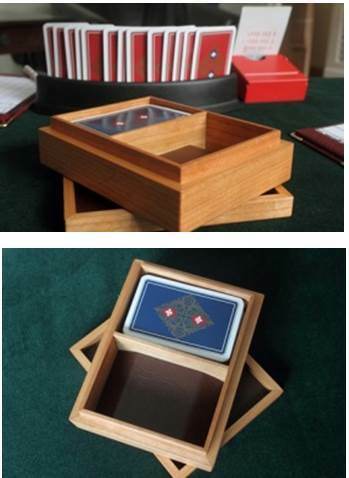 For example she offers a special range of exclusive handmade wooden card boxes and leather bridge sets which are specially made for her and sell well. 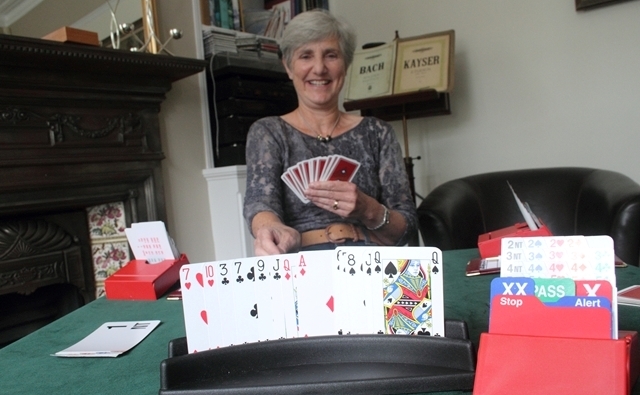 Being an online business catering to the world’s most popular card game has brought orders to her door from all over the world including America where bridge is hugely popular, Australia, Malta, and Spain where it is played by many ex-patriates. “This was never going to be a huge business but it’s very steady and I am massively busy at Christmas,” said Linda, who ships out so many sackloads of gift parcels during the festive season that she has her own franking machine. That’s no surprise when you look at the range of excellent gifts offered by Richmond Bridge. There are 30 different designs of playing cards, of which the most popular are Monet paintings at £15.75 for two packs. While other gifts range from a handsome tall glass jug hand etched with clubs, diamonds, hearts, and spades, for £32, to beautiful boxed bridge sets in different designs from £25.95, to a top of the range luxury leather bridge set at £335.